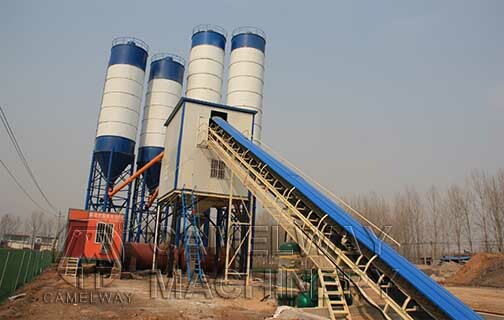 Concrete batching plants are widely used to produce various kinds of concrete including quaking concrete and hard concrete, suitable for large or medium scale building works, road and bridge works and precast concrete plants, etc. How does a concrete batching plant work? If you have ever seen a batching plant, you will find there are at least two large containers. The raw are poured into these containers and delivered to a central mixer through a conveyor built. To maintain consistency in output, a batch control device weighs each material precisely before moving it to the mixer. A batch control device is run by an operator, who inputs on the computer the type of concrete that needs to be mixed, and how much concrete is needed. As soon as the start button is pressed, the different inputs then go into the mixer. Then put the mixed concrete into a concrete transport truck. Water will be added to the mixture inside the truck and mixed during transport towards the job site. Zhengzhou CamelWay Machinery manufacture is one of the large-scale enterprise specializing in construction machinery. To know details about the working principle, you can visit this website: http://www.jsmixer.com/. If you want to know more information about the concrete equipment or buy it, please contact us at any time. We will try our best to service for you. This entry was posted in Pakistan Batching Plant and tagged concrete baching plant by camelway. Bookmark the permalink.